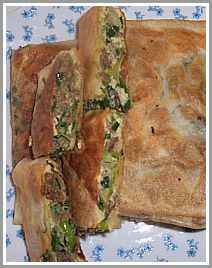 Martabak Asin is very delicious as a snack and as a company for white rice as a side dish. This snack is loved by many people especially in Bandung. If you're looking for this snack in Bandung, try Martabak San Fransisco on Burangrang street. They have the best from all. This snack is much known in this city and people from Jakarta come in the weekend to taste their buds, and this snack is also one of their favorite. Use the paste of gulai to make martabak asin. Make a smooth paste of this above ingredients. You can use food processor if you like it. It’s fast and easy. Or you can use mortar and pestle in traditional way. Set the paste aside. Add the paste that you’re already made. Mix it with the meat until well. Remove from the fire. Add into the big bowl: the chopped leeks, the eggs and the grounded meat. Mix it together until well. Add some salt if needed. Spread out the lumpia or spring roll sheets and put some of the mix in the middle of it, Fold one side and follow the left and the right side. And at the edge of the sheets make it tight with some eggs mix. It has to be flat, not as a lumpia. Baked in the flat pan with a little bit oil, on low fire. Be careful, the fire not too high, the martabak would be baked too soon but the inside it’s not really done. To prevent that the mix too watery after time, make the mix in two parts. The first part uses the half of the leeks, the eggs and the grounded meat. After the first part completely ready then make the second parts. And after you put the mix into the lumpia sheets, don’t wait too long to baked it. After short time the sheets would wet from the eggs and it would be difficult to take it and you get the chance that the sheets would be broken and all of the mix would come out.